How Hackers can Track your Mobile phone with a cheap setup ? Cellular phones have become a ubiquitous means of communications with over 5 billion users worldwide in2010, of which 80% are GSM subscribers. Due to theiruse of the wireless medium and their mobile nature, thosephones listen to broadcast communications that could reveal their physical location to a passive adversary. University of Minnesota researchers found a flaw in AT&T and T-Mobile cell towers that reveals the location of phone users. The attack, described in a Research paper (Click to Download Pdf), is most useful for determining whether a target is within a given geographic area as large as about 100 square kms or as small as one square kilometer. It can also be used to pinpoint a target's location but only when the attacker already knows the city, or part of a city, the person is in. Ph.D. student Denis Foo Kune says, “Cell phone towers have to track cell phone subscribers to provide service efficiently. For example, an incoming voice call requires the network to locate that device so it can allocate the appropriate resources to handle the call. Your cell phone network has to at least loosely track your phone within large regions in order to make it easy to find it“. The messages contain I.D. codes. In order to match the codes to the cell phone number, researchers called the phone three times. The code that appeared three times in the same time period in which researchers were listening in is most likely the code of the cell phone.“From there we can use that I.D. to determine if you’re around a certain area or if you’re on a particular cell tower,” he said. 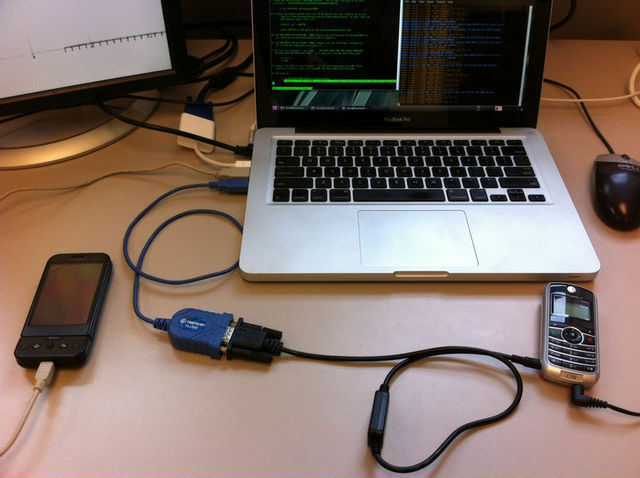 The process requires a feature cellphone and a laptop, running the open-source Osmocom GSM firmware and software respectively, along with a cable connecting the two devices. It also uses a separate cellphone and landline. The attackers use the landline to call the target's cellphone when it's located near the same LAC as the equipment and use the laptop output to monitor the broadcasts that immediately follow over the airwaves to page the target phone. The implications of this research highlight possible personal safety issues. The group explains their work in a recently presented at the 19th Annual Network & Distributed System Security Symposium and was titled “Location Leaks on the GSM Air Interface”. The group has also contacted AT&T and Nokia with some low-cost options that could be implemented without changing the hardware.